Have you ever seen Life is Beautiful? It's an Italian film set during the Holocaust, and it stars Roberto Benigni, the guy who said he wanted to “kiss everybody” when he accepted his Oscar for Best Actor for the role. It's absolutely magical, which may sound like a strange thing to say about a movie set primarily in a concentration camp, but that's what happens when someone as effusive and whimsical as Benigni is involved. He plays a man named Guido who is taken to Auschwitz along with his wife and young son. To keep his son from getting scared, he constructs an elaborate story to explain why they are in the camp and what is happening to them. He tells his son they are playing a secret game, and the grand prize is a tank. He has to pull off some ridiculous stunts along the way to keep up the ruse, but he always manages to keep the game going and his son smiling. Knowing that the truth is too grim for a child to bear, Guido creates an imaginary world around them in which love and joy can still exist. 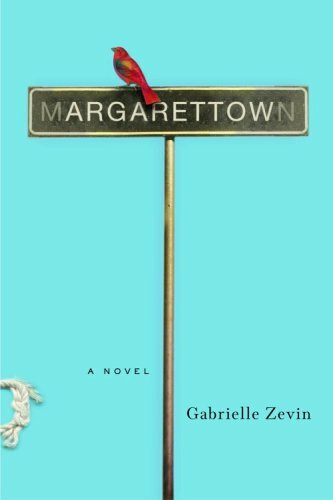 It's one of the most beautiful depictions of love I've ever seen, and it's the same kind of story that Gabrielle Zevin has crafted in Margarettown, her debut novel from 2005. Maggie Towne is a woman with many layers. Zevin's narrator, N., learns quickly that to love her means to love many women at once, and he does—almost all of them, anyway. There's Marge, the middle-aged, droopy-breasted cynic, of whom he's not so fond, and Greta, in her thirties and suffering emotionally, about whom he's only heard murmurs. But there is appeal in seven-year-old May and teenager Mia, and even in wise Old Margaret, a friendly septuagenarian. Strange as it may seem, N.'s beloved Maggie embodies all these women at once, and he must find a way to live with them all. As the book progresses, we learn N.'s reason for writing it: he is dying, and he wants his daughter Jane to know the story of his life with her mother, the multi-faceted Maggie. Suddenly the odd devices and magical details make sense—this isn't so much a factual history as it is a way for Jane to make sense of her parents' lives. N. is telling Jane a version of their story in which love and joy can still exist. Facts aren't particularly important here, just as they aren't when Guido lies to his son about Auschwitz. Sometimes story takes precedence over truth, or maybe it reveals a better one. I adored this book. I loved the sections that strained credulity, I loved the tempestuous but passionate relationship, and I loved the charming little recurring motifs. I'd read along and there would be another extra-long twin mattress, and I'd smile, because who would ever have picked an extra-long twin mattress as a symbol of love? Zevin must be a very creative and very wacky person. This is the best book you've never heard of. It's a story that couldn't be told any other way. Try it out—I promise you won't regret your trip to Margarettown.